Three EU-based dose-confirmation studies were designed to confirm under field conditions the dose and frequency of treatment with Exzolt that was needed for efficacy against natural infestations with D. gallinae. Because the earlier dose-determination studies showed that the frequency of treatment is also relevant for efficacy, the dose-confirmation studies focused on 2 treatments at a 7-day interval. An extensive 9-site field study assessed the efficacy of Exzolt for chickens reared under commercial production conditions. The objective of dose-determination studies was to select a treatment regimen (dose, number of administrations, and administration interval) that provides efficacy (killing activity) against poultry red mites that feed on Exzolt-treated chickens. The duration of efficacy was intended to cover a period that is needed for the completion of 2 consecutive mite life cycles – a duration of at least 15 days. Mite development from egg to the first blood-feeding stage (hematophagous protonymphs) normally occurs within 3 to 5 days (Figure 1-2), and a blood meal is required for further development of protonymphs to deutonymphs and adults, and also for production of mite eggs. Therefore, the target efficacy duration (~15 days) ensures that all non-blood-feeding mite development stages present at the time of first Exzolt administration will eventually ingest fluralaner once they develop into a blood-feeding stage. The efficacy of Exzolt administered in the drinking water of chickens at the recommended dosage regimen of 0.5 mg fluralaner/kg BW twice 7 days apart was evaluated in multiple studies, including a dose-determination study using artificial infestation as well as several dose-confirmation studies and a 9-site field-efficacy study conducted under natural infestation conditions. Total or near-total elimination of mite populations in the treated houses was quickly achieved in all layer, breeder, and/or pullet houses treated. This effect was maintained for a duration largely exceeding the duration of effective blood concentrations required to kill mites feeding on the treated birds. In several studies, positive impacts on productivity (e.g., laying rate, fertility, etc.) were observed for treated birds, likely due to the ability of Exzolt to massively decrease the mite population of the house. 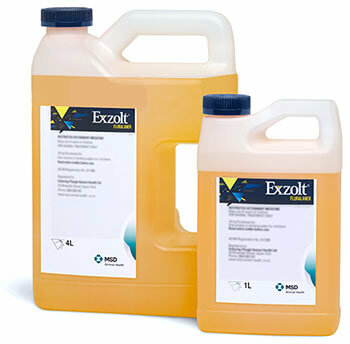 Exzolt clearly offers potent, consistent, convenient, and safe efficacy against poultry mites and thus helps prevent the significant adverse economic consequences of inadequately controlled mite infestation. The Exzolt Mixing and Administration Guide provides a concise, step-by-step outline to help practitioners and producers get started with proper administration of medication for treatment. The guide provides instruction to ensure Exzolt is dosed, mixed and used correctly.